“Women Destroy Science Fiction” is the Book of Honor at Potlatch24! Good news! 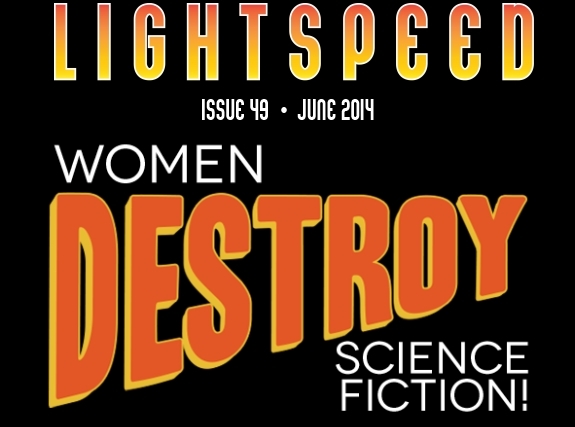 Lightspeed Magazine’s June 2014 issue of “WOMEN DESTROY SCIENCE FICTION” has been chosen as the Book of Honor at Potlatch 24. WDSF is the issue that was high-jacked last June by us women under the awesome leadership of Christie Yant, Assistant Editor of Lightspeed Magazine. The amazing Gabrielle de Cuir of Skyboat Media was our fantastic Podcast Producer, with Mur Lafferty beautifully doing all of the intros. For my part, aside from being in the company of so many incredibly gifted women, I was thrilled to have the opportunity to narrate Carrie Vaughn’s wonderful short story Salvage. This issue is packed full of so much wonderful SSF love you won’t want to miss a minute of it! You can check out most of the issue here for free at June 2014 Lightspeed Magazine. WDSF in it’s entirety can be purchased in various e-reader and print formats at Women Destroy SF. Potlatch 24 will take place in Seattle, Washington this weekend, Feb 6-8th! So if you live in Seattle or the surrounding area, do try to check out the convention if you can! It looks like it’s going to be a pretty fabulous weekend. Here’s a link to all the festivities! Potlatch24Program. This entry was posted in Narration, News, Press, Voice and tagged Christie Yant, Gabrielle de Cuir, Skyboat Media; LIghtspeed Magazine; WDSF; Science Fiction; Women Destroy Science Fiction; Susan Hanfield; Potlatch 24; Seattle Writers; Seattle Science Fiction Lovers;. Bookmark the permalink. ← The Lonely Heart … Just In Time For Valentine’s Day!